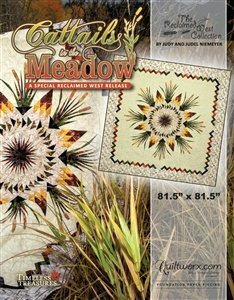 HOME > Judy Niemeyer Quiltworx > Cattails in the Meadow Special Edition 81.5" x 81.5"
Cattails in the Meadow Special Edition 81.5" x 81.5"
A Special Reclaimed West Release was designed by Brad and Judy Niemeyer for foundation paper piecing. The pattern was part of the inspiration for the Reclaimed West Fabric line designed by Judy and Judel Niemeyer with Timeless Treasures and was made out of the collection in an expanded size to the original pattern, which is still on the Market and will continue to be on the market even after this pattern has sold out. With only 2,500 copies available, this design won’t be around forever! It increases the size of the pattern from 70” x 70” to 81-1/2” x 81-1/2”.